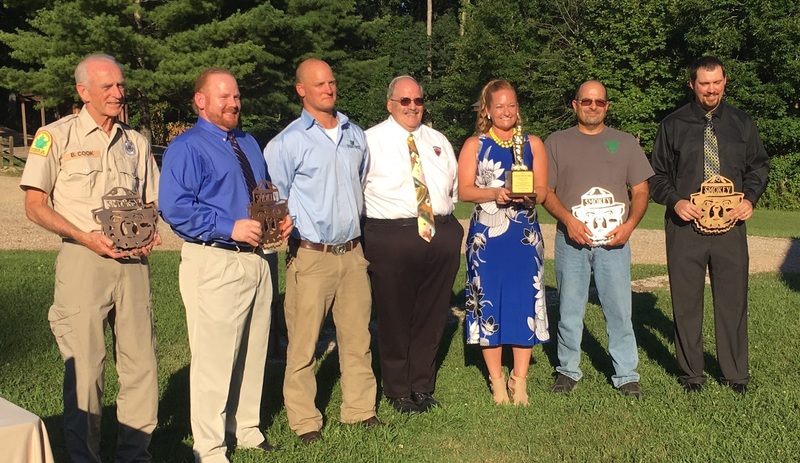 Delaware state forester Michael A. Valenti was on hand in Ohio as Delaware Forest Service education specialist Ashley Melvin received the Gold Smokey Award for her fire prevention efforts as part of the Mid-Atlantic Fire Compact. 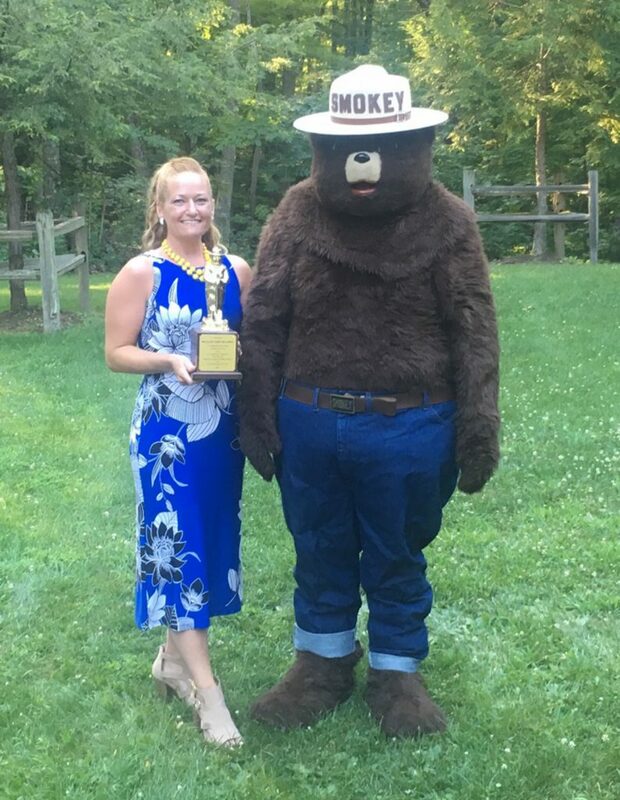 DOVER – Ashley Melvin, the Delaware Forest Service’s education specialist who directs its successful Smokey Bear fire prevention program, received a Gold Smokey Award at an annual meeting of state foresters in Ohio recently. 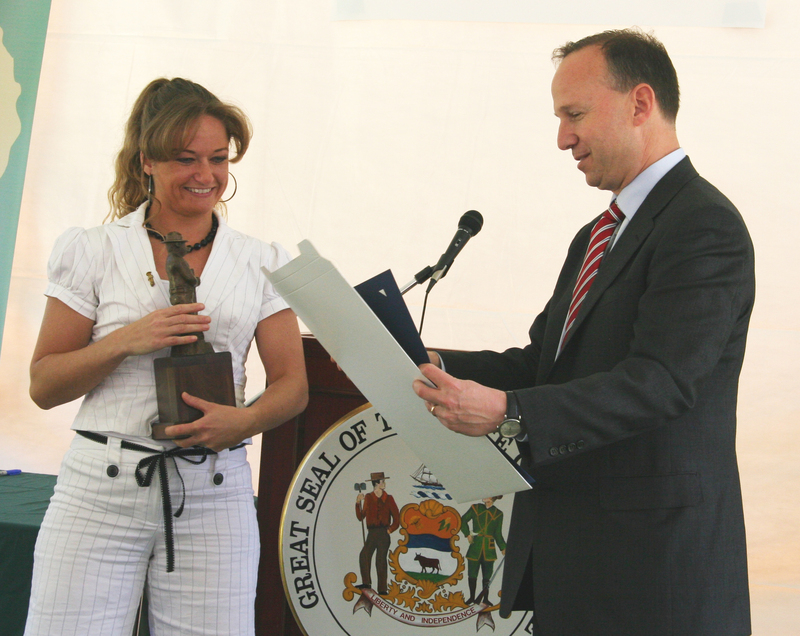 The award was presented to the Mid-Atlantic Fire Compact‘s education committee, of which Delaware is a member. The compact is comprised of seven states including Delaware, Maryland, New Jersey, Ohio, Pennsylvania, Virginia, and West Virginia. In the world of wildfire prevention, there is no greater honor than to receive a Smokey Bear award, especially the national Gold Smokey Award. These special awards are reserved for people or organizations that provide sustained, outstanding service, with significant program impact, in the wildfire prevention arena. Honorees demonstrate innovation, creativity, commitment and passion for wildfire prevention. The Mid-Atlantic Fire Compact’s education committee meets once or twice a year to create prototypes that help with forest fire prevention education. The group has created bandannas, large Smokey Prevention Plinko Games for events, large puzzles for children to use at events, compiled a three-DVD set of old Smokey Bear videos, songs and artwork and large fire danger signs with Smokey Bear. The group also coordinated an international multi-compact workshop in Mystic, Conn. The Mid-Atlantic Fire Compact, comprised of seven states including Delaware, received a Gold Smokey for its fire prevention efforts. Next year, Smokey Bear celebrates his 75th Birthday. To honor the occasion, the compact created a special 16-page supplement for the Highlights children’s magazine that will appear in early 2019. The issue will be delivered to subscribers in all seven states, with an additional printing of 168,000 copes for standalone use. Veteran educator Fred Turck of Virginia, the only person to earn the coveted Gold Smokey twice for his outstanding work in fire prevention education, noted that each item takes about a year to move from concept to production. 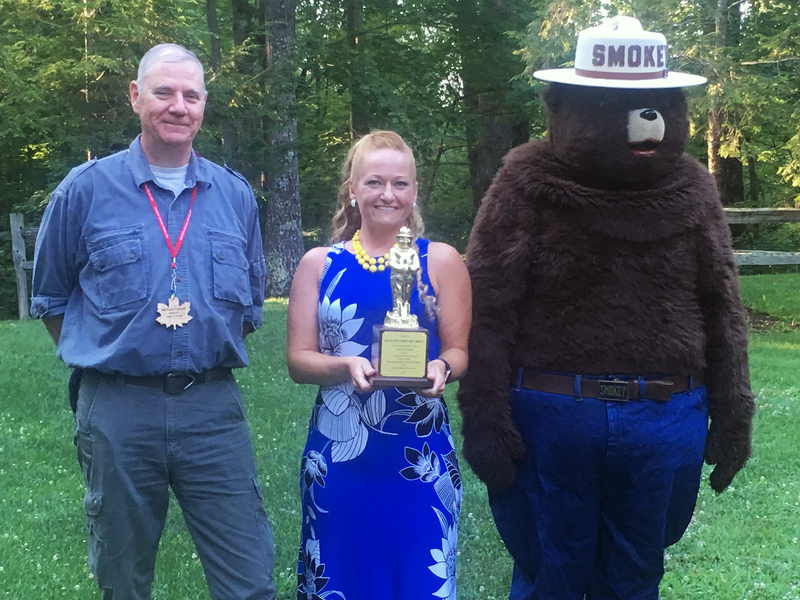 Delaware Forest Service educator Ashley Melvin received the Gold Smokey Award in Ohio recently for her efforts with the Mid-Atlantic Fire Compact’s fire prevention and education committee. Every student receives a gift bag of complimentary Smokey Bear materials and school supplies. Many of the bags are assembled by senior citizen volunteers from the Modern Maturity Center in Dover’s RSVP Program. Every year, volunteers put together more than 6,000 bags containing Smokey-themed comic books, wrist bands, rulers, pencils, and bookmarks.